My medicine wheel theme for February is "Gratitude". 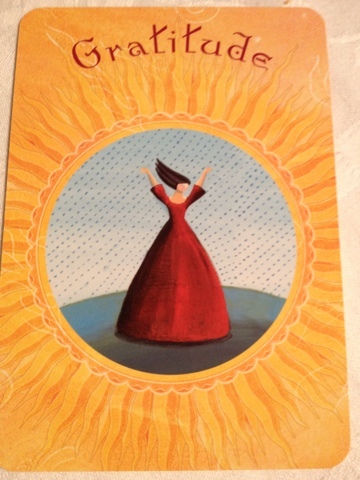 I love this card because there is so much in my life that I am grateful for. If I was to write all that I am grateful for, this post would be very long. So I will just share a couple. I'm grateful for my my wonderful family. I'm grateful that my parents bought me up to be a strong woman. I'm grateful for the wonderful friends I have. I'm grateful that I have the confidence to stand by the choices I have made, even if they weren't all good choices. I just know later this month I am going to be extremely grateful for the outcome.